Looking for a quality Commercial Painter in Warrenville, Illinois? B.A. 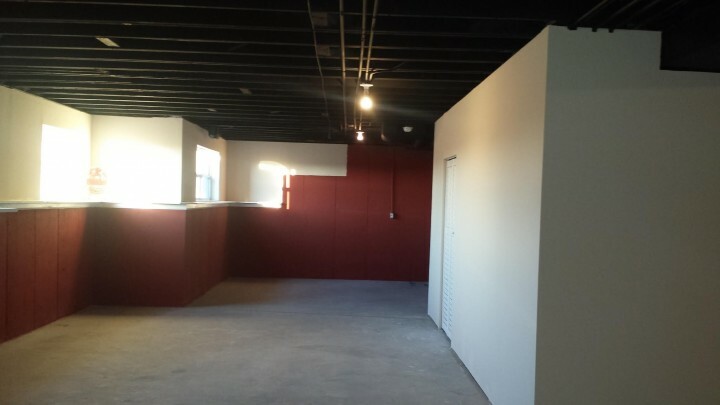 Painting, LLC has proudly provided commercial painting in Warrenville, IL since 2007. Over the years we have painted office building, retail centers, apartment and condominium completes and other commercial facilities throughout the area. B.A. Painting, LLC's professional commercial painters have completed extensive training and have many years of experience in painting offices and industrial buildings in and around Warrenville, IL. We keep up to date on Warrenville's most used commercial building materials and on the most effective paints and techniques, so that we can consistently deliver the best products and practiced available today. When it comes to affordable high quality commercial painting in Warrenville, IL, B.A. Painting, LLC is the commercial painting contractor Warrenville businesses can trust. Give us a call and we'll be happy to stop by and provide a free estimate. 5★★★★★ - "I have read mixed reviews about this company, but I am very happy with them. I had 30-year-old exterior cedar I was thinking about replacing. George and his company truly restored the wood so it will last another 10 years and looks great. The price was also great. George was able to match the color of another house that we liked as well." 5★★★★★ - "I would highly recommend BA for any of your painting needs. Jorge the owner is easy to work with, very responsive and definitely wants to make sure you are completely satisfied. He was by far the most reasonable quote around for my entire house. Paid exactly what our original quote stated. The guys that work for him are just as friendly and hard working. I will for sure use him again in the future." 5★★★★★ - "We had two estimates - one from this company and one from another. The other was way overpriced and said they really don't like doing cabinets, their specialty is furniture painting. Ohhhhh k. George at this company came out and his estimate was very thorough, reasonably priced and they could start in a fair amount of time. I am so glad we chose them. Our kitchen looks just like the before and after photos all over Pinterest! It's so fresh, seems larger, brighter, just beautiful. They were extremely courteous and professional. We even had a furniture delivery I forgot about while I ran some errands and they would not let the furniture guys into the house to drop it off. That's amazing. Their work is very detailed and my husband and I are just in awe. I posted a before/after pic on Facebook and so many people want to know who we used. You know I will be sharing that info! Thanks B.A. for beautiful cabinets and a beautiful experience! :)"
5★★★★★ - "I hired George to paint my cabinets in my kitchen. He was very pleasant and explained what supplies he would be using and how long it would take. The job was done beautifully and looked like brand new cabinets but cost 1/4 of what new cabinets would cost! I get compliments all the time. I would highly recommend this company to do any painting in your home!" 5★★★★★ - "Jorge and his team were excellent. Jorge came out to survey the work very quickly and I had the proposal the next day. His price was very competitive. More importantly, I trusted his professional advice more than the other contractors that bid on the job. We had textured paint & wall paper that needed to be removed and also had our stair treads, stringers, and handrails painted. His team was very friendly & professional and made a week long invasive project as stress-free as possible for my family. It feels like a brand new home! I would definitely refer my friends and associates to Jorge and his team!" 5★★★★★ - "They painted my kitchen cabinets white and they look beautiful! Everyone was very nice to work with and very neat!" 5★★★★★ - "This is the second time I had George Barba paint my house. This time he also painted my deck. He and his crew are friendly and professional. They pay close attention to detail, which is what I wanted from the work. George found, during the painting some rotted boards and he replaced them. He does not take shortcuts. I highly recommend his work. In fact, I am planning an indoor project and I hope that he is available to do the job. Thanks, George for a great job." 5★★★★★ - "Great work! Professional, and cleaned up very well." 5★★★★★ - "We had our kitchen cabinets re-finished and they did an outstanding job. Provided us a variety of options on colors and did a very thorough job in completing the project. I would recommend them." 5★★★★★ - "I had my kitchen cabinets repainted after the first company I hired painted them the wrong color and wasn’t willing to work with me. They look amazing now. It is always awesome to find someone who takes their business very seriously like George does. I called several companies to bid the job and not only did George have the best price but he was also the most knowledgeable and professional. He came out after hours and brought paint samples and painted large swatches on a spare cabinet door. George is a fantastic resource for painting tips/tricks. George’s team painted my kitchen cabinets, kitchen walls, doors and trim. George is an incredibly kind man, and I felt very comfortable with him and his crew in my home while I was at work. His crew showed up early, got diligently to work, and completed the job before the estimated completion time. They cleaned up extremely well even between days. George was very attentive to make sure that I was satisfied with the work before signing off. I couldn't have asked for a better experience and would highly recommend B.A. Painting to anyone needing their services." 5★★★★★ - "Jorge Barba and his guys are very detailed and clean. He knows how to answer questions and help us to get the right colors. We had a very hard time picking out colors and he showed us so many samples after hours. I am very happy." 5★★★★★ - "These guys are the best around..I had my kitchen cabinets refinished and they look amazing. Jorge and his crew were on time and very generous, kind and courteous everyday they were at my home. True professionals... And not to mention the price, Jorge will work with you and your budget if you need him too. Overall, I would use these guys again without a doubt. Highly recommended !!" 5 ★★★★★ - "B.A. Painting recently painted our kitchen cabinets. Jorge was extremely knowledgeable and took the time to explain the different types of paint and processes for painting cabinets. His team was neat, courteous and professional. Their work was high quality. Jorge and his team were patient and dedicated to addressing any concerns we had. In addition, his prices were very fair! We are super happy with our new kitchen!" ★★★★★ - "We hired B.A. Painting to paint our kitchen cabinets. We are very pleased with the result. The painters work hard and are very neat. We would hire this company again." 5★★★★★ - "BA Painting made it easy to plan with an accurate estimate and timely work. They did a great job and were in and out of the condo in just a couple of days!" 5★★★★★ - "We are very happy with the job you did in painting our family room, bedroom & bath, and ceiling in the Living room/kitchen. Everything looks wonderful! I think you have the best crew working for you! They worked hard all day and cleaned up so we could live in the house at the end of each day! Very talented and nice people to work with! Please call us some time in August to give us an estimate for further work in the fall."